As a cook, and as what people perceives as a “talented chef” I am often asked to do things and there. I had a small catering job this past Saturday and the lady of event was also hosting a birthday party for her child that same morning. She was so overwhelmed that she asked me to help her fix a fun snack for the kiddos that were coming to the birthday party. 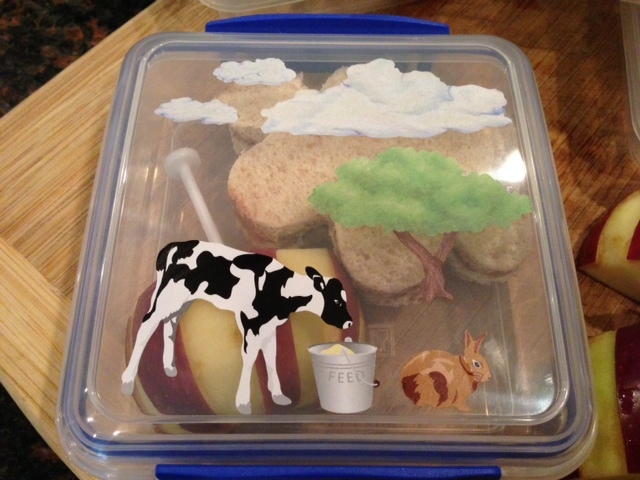 She wanted for those snacks to be in a decorated lunch box and she wanted the snacks to fit the theme of Apples and Farm. 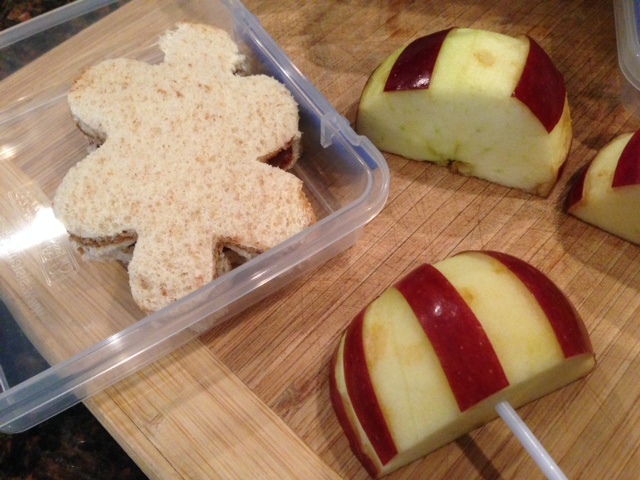 After showing me a few picture of what she was thinking, we agreed to use the ides of a snack that Cute Food for Kids Web Blogger had posted on her blog. I purchased the box at a near store and purchased a few stickers at Micheals to make the farm scene. Of course, you could decorate the box however you wanted. 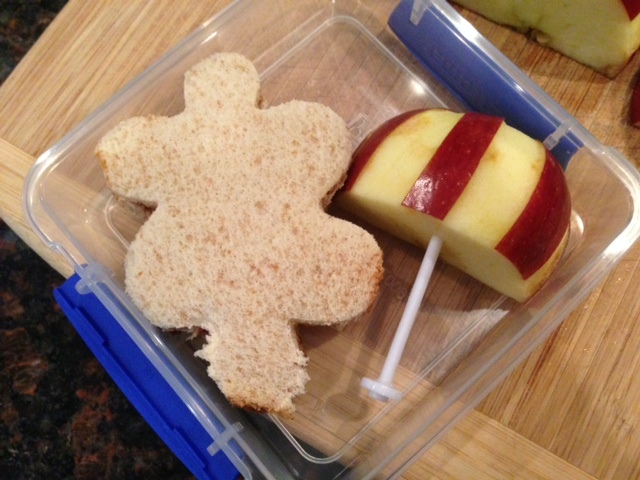 The snack consisted of an apple shaped umbrella and a cloud cut sandwich. I purchased red delicious because they are a beautiful red color and the color is even unlike many other apples. Once you have chosen your apples, you will need to wash them well under running water. 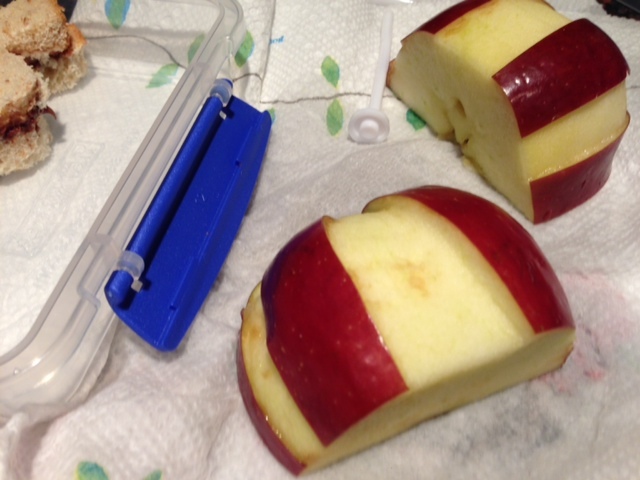 Then look for the most even side of the apple and cut the apple in half. Then starting at the top of the apple, cut two lines down to make a triangle. With your knife, trace two other triangles aside this main triangle. With the tip of the knife, slide under the skin of the apple and remove the skin as shown below. 6. 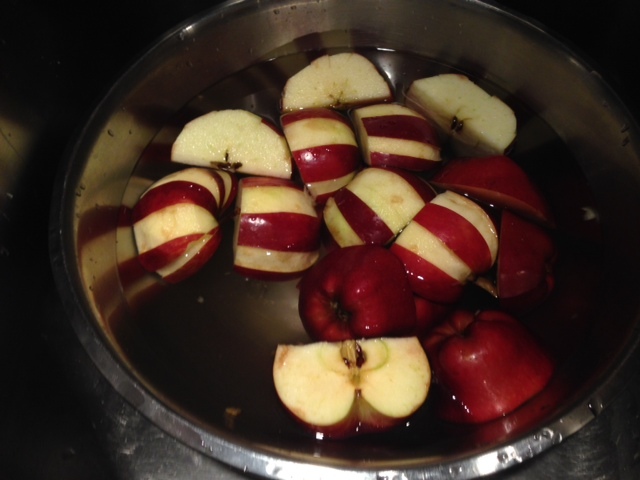 When the apples is carved, place it into a water bath with either a few drops of lemon, or a bit of salt. 7. 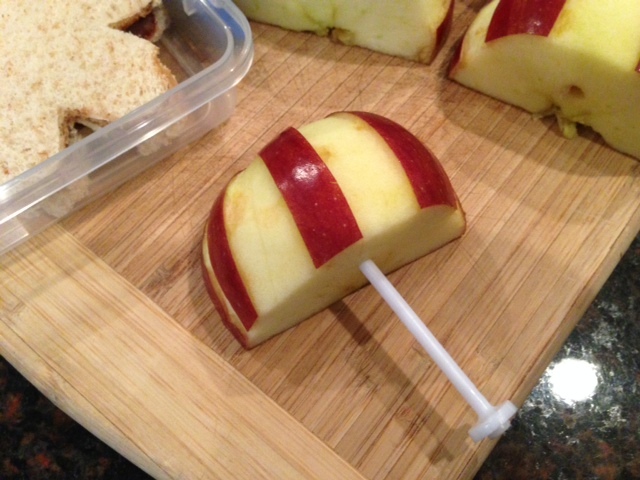 Continue with the rest of the apples. 8. Right before you are ready to fix the boxes, place the handle of the “umbrella”. 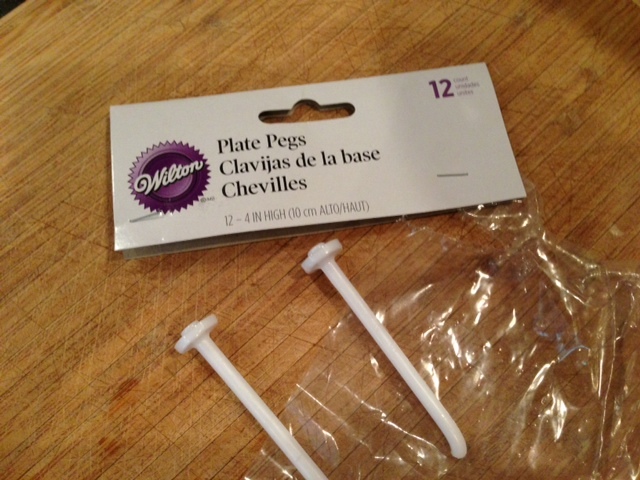 I could not use cute food picks, so I purchased cake pegs instead that I broke a bit to shorten them. 9. 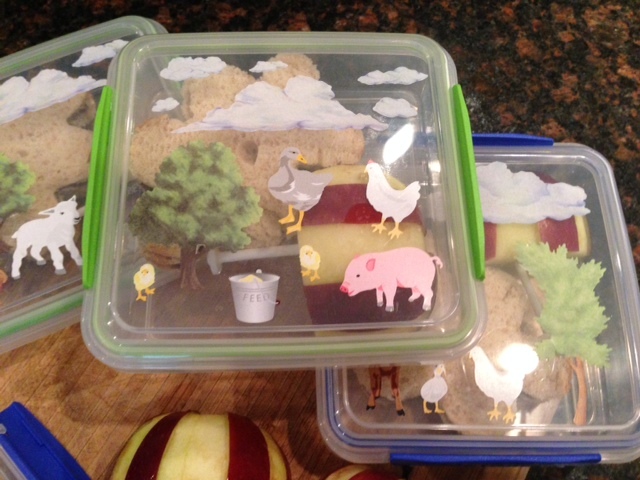 When you are done with the apples, proceed with the sandwiches. I used honey wheat to make it a bit healthier. The filling of the sandwich was peanut butter and nutella, but of course you can use anything else. Since I was not able to find a cloud shaped cookie cutter, I purchased a large daisy cookie cutter and bent it so that it would look like a cloud. Place the sandwich and the umbrellas into each box and close. C’est tout!!! To cute!! !